Thursday 18th April open 8.30am -12.30pm & 5.00pm -6.30pm Friday 19th April Good Friday CLOSED. Monday 22nd April Easter Monday CLOSED. Tuesday 23rd April 8.30am -6.30pm open as usual. The GP hub is an out of hours service provided by the Cambridgeshire and Peterborough CCG. They offer appointments in a nurse led clinic located at the North Brink Practice on Wednesday evenings and Saturday mornings. Patients should contact their own surgery to discuss if they are suitable for an appointment. 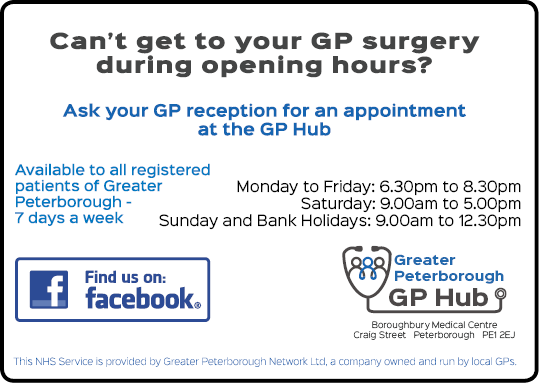 Patients can also be seen in the Peterborough GP hub. Are your details correct? It is important that we hold the correct contact details for you, if you have recently moved house or changed your telephone number please use this link to inform us of your changes.